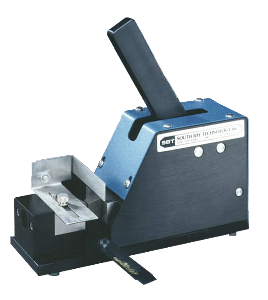 The Model 310 Disc Punch is designed to prepare ductile metals and soft materials for TEM without mechanical distortion. Solid construction and high tolerance design allow maximum force to be used with difficult materials while maintaining specimen quality. A specimen alignment fixture is included which guarantees maximum specimen yield and precise specimen location. After the disc is punched it is automatically ejected from the die and collected in an easily removable tray. The precise construction of every unit guarantees sharp edges and easy disc ejection even after long term use. Alignment fixture included for maximum yield and precise specimen location.